Communications in highly mobile environments is critical. With digital transformation being a major driver for efficiencies in the transportation and logistics (T&L) industry, from long haul and “the-last-mile” deliveries to major projects in construction supply, communication has become an indispensable component to quickly react to unforeseen events. Drivers have been using CB (citizen band) radio communication for a long time. 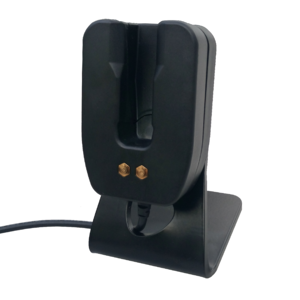 The Voice Responder provides them with a reliable solution to communicate in and around their truck through a single button with up to two channels. With the launch of the AINA Vehicle Cradle (AVC1) at the beginning of 2018, drivers can revert to the same movement of picking up a speaker mic, like they did using CB radio . And, they are not required to think about connecting the speaker mic to a power cable after a long work day, anymore. 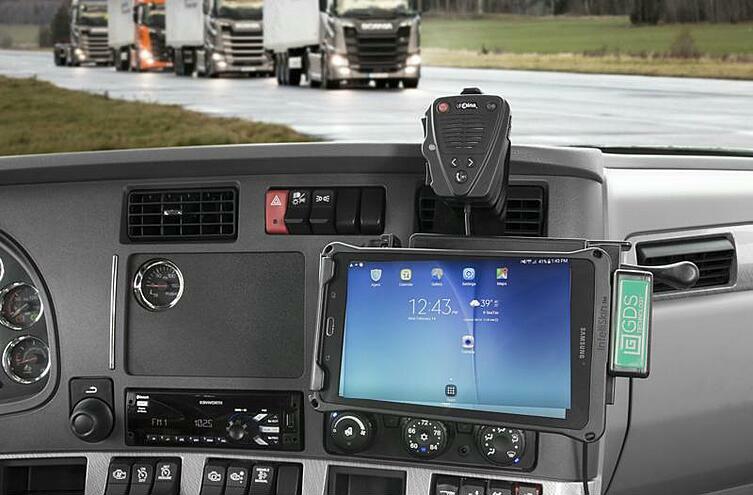 One of the most important benefits of the AINA Vehicle Cradle is that it provides fleets with a simple way to install the speaker mic in arm’s reach next to the tablet in a way that’s compliant with the department of transportation (DOT) regulations. In states where a tether is required, the Voice Responder can be easily hooked and unhooked from the charging cradle through a coiled wire, providing additional safety. The product combination of Voice Responder and Vehicle Cradle has been so highly adopted by companies around the world that it can now be called a de facto standard in the construction supply and T&L industry. But the T&L industry is not the only industry that requires the use of communication solutions in cars. Fargo Deputy Chief Joseph Anderson estimates that a police officer spends roughly 75 percent to 80 percent of their shift in their cars, which could be 6-8 hours a day. Although the speaker mic battery is sufficient to last for at least 3 shifts, the vehicle cradle provides yet again a combination of convenience and simplicity to charge the mic while using it. The daily routine for many officers, field engineers, foreman workers and project managers is to come back to the office to handle paperwork, emails and other administrative tasks. With a ton of tasks on hand, providing a simple way to charge their communication devices is necessary so it’s not forgotten. The AINA Desktop Cradle provides a dedicated spot for the speaker mic to keep the workplace tidy while still being able to use it when needed. A tidy and organized workspace gives the impression of organized and structured work processes, something important when working in customer facing roles. At service counters in the hospitality and healthcare industry as well as in airports, communication is important to provide a high level of customer satisfaction by quickly responding to any customer needs. At front desks and counters, communication solutions can be shared between staff and it is therefore more important to provide dedicated spots where they can be placed. The AINA Desktop Cradle provides not only a dedicated spot but also allows the Voice Responder to be used without restrictions while keeping it charged at all times. These worst case scenarios lead to a loss of devices and frustrated workers that don’t treat their communication solutions respectfully often resulting in charging connectors being broken and a messy workspace, reducing employee morale and attitude that can impact day-to-day work. The AINA Five-unit Desktop Charger can be placed on a table or mounted on a standard rack. It reduces charging cables to a minimum and provides an easy spot to slide in the Voice Responder. Team leaders can therefore easily track returned devices and identify any missing assets. AINA Wireless’ goal is to make communication safe and simple. Communication is a key component of everyone’s work life but is rarely anyone’s primary job . With these new additions to the AINA product portfolio, IT departments have the chance to simplify their staff’s work life. The logistics around using and charging devices become almost negligible. At the same time, the Smart Charging Solutions drive efficiencies and reduce failure and loss rates across the device population, saving overall IT investments. Click here to find out more about AINA Wireless Smart Charging Solutions!